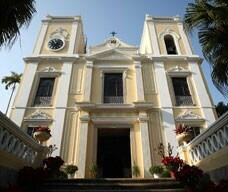 Built by the Jesuits in the mid-16th century, this is one of the three oldest churches in Macao. Its present appearance and scale was acquired in 1846. 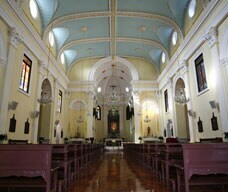 Situated on the southern coastline of Macao overlooking the sea, families of Portuguese sailors used to gather on the front steps of the church to pray and wait for their return, hence it was given the name: Feng Shun Tang (Hall of the Soothing Winds). The neighbourhood where the church is located used to be fairly wealthy, thus explaining the building's scale and wealth of architectural treatment. 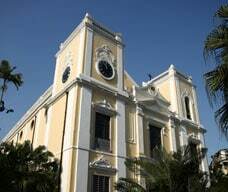 It is a neo-classical structure, with subtle Baroque decorative inspirations.